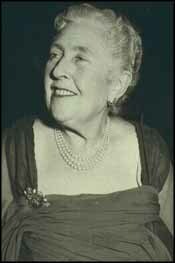 gatha Christie was born Agatha May Clarissa Miller in Devon, England in 1890, the youngest of three children in a conservative, well-to-do family. Taught at home by a governess and tutors, as a child Agatha never attended school. She became adept at creating games to keep herself occupied at a very young age. A shy child, unable to adequately express her feelings, she first turned to music as a means of expression, and later on in life, to writing. In 1914, at the age of 24, she married Archie Christie, a World War I fighter pilot. While he was off at war, she worked as a nurse. It was while working in a hospital during the war that Christie first came up with the idea of writing a detective novel. Although it was completed in a year, it wasn't published until 1920, five years later. The Mysterious Affair at Styles gave the world the inimitable Hercule Poirot, a retired Belgian police officer who was to become one of the most enduring characters in all of fiction. With his waxed moustache and his "little grey cells," he was "meticulous, a tidy little man, always neat and orderly, with a slight flavour of absurdity about him. Christie wrote over thirty novels featuring Poirot. Among the most popular were The Murder of Roger Ackroyd (1926), The Murder on the Orient Express (1934), and Death on the Nile (1937). In 1926, Archie asked for a divorce, having fallen in love with another woman. Agatha, already upset by the recent death of her mother, disappeared. All of England became wrapped up in the case of the now famous missing writer. She was found three weeks later in a small hotel, explaining to police that she had lost her memory. Thereafter, it was never again mentioned or elaborated upon by Christie. Another of Christie's most well-known and beloved characters was introduced in Murder in the Vicarage in 1930. Miss Jane Marple, an elderly spinster in the quaint English village of St. Mary Mead, solved all manner of mysteries with intense concentration and intuition. Featured in twelve novels, Miss Marple exemplified the "cozy" style, a form of mystery fiction that became popular in, and ultimately defined, the Golden Age of fiction in England during the 1920s and 1930s. Christie ultimately became the acknowledged "Queen of Golden Age fiction. "56 In all, she wrote over sixty-six novels, numerous short stories and screenplays, and a series of romantic novels using the pen name Mary Westmacott. Several of her works were made into successful feature films, the most notable being Murder on the Orient Express (1974). Her work has been translated into more than one hundred languages. In short, she is the single most popular mystery writer of all time. In 1971 she was awarded the high honor of becoming a D.B.E., a Dame of the British Empire, thereafter being referred to as Dame Agatha. Sponsored by The Case: "The fun and challenging mystery website"
The History of the Mystery is a product of MysteryNet.com: "The Website for Everything Mystery"
Credits: History of the Mystery Summary and Topic Areas written by Sandy Barnett. MysteryNet.com, the History of the Mystery, and The Case are produced and published by Newfront Communications. Copyright © 1996 Newfront Communications. All rights reserved. Do not duplicate or redistribute in any form.